If you hold stock in a closely held business, you may be able to use that stock as a powerful way to support JBS. You would like to avoid capital gains taxes on the shares you donate to JBS. You would like to support JBS. A charitable gift annuity. Funding a charitable gift annuity with closely held stock not only provides you with fixed payments for life and allows you to support JBS, but it can offer numerous financial benefits. You may receive a federal income tax deduction and, if you use appreciated stock, you can eliminate capital gains tax on a portion of the gift and spread the rest of the gain over your life expectancy. It is possible to contribute stock in either a C or S corporation in exchange for a charitable gift annuity.The contributed shares must be valued by a qualified independent appraisal whenever the deduction exceeds $10,000. The appraisal is required in order to substantiate your federal income tax deduction. A charitable remainder trust. You may be able to use all or a portion of your closely held stock to fund a charitable remainder trust. If you do, you receive a federal income tax deduction on the appraised value of your gift and you pay no capital gains taxes at the time of the gift. The trust pays you or other named individuals payments every year for life or a term of years. When the trust term ends, the remaining principal goes to JBS as a lump sum. Although a charitable remainder trust with a flip triggering event works well with most business interests, this type of trust cannot be the owner of S Corporation stock. A charitable lead trust. In certain situations, you can create a charitable lead trust that allows you to pass your closely held stock to your heirs after supporting JBS. The trust makes regular payments to JBS for a period measured by a fixed term of years or the lives of one or more individuals. After the term ends, the remaining assets, including any appreciation, pass to your heirs. A properly designed lead trust will produce an estate or gift tax deduction for the value of that portion of the trust designated for JBS. Contact Ginger Imster at 314-993-4045 ext. 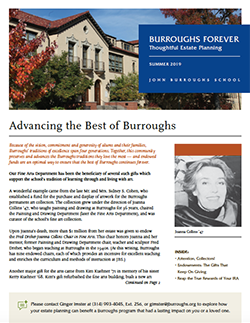 256 or gimster@jburroughs.org for additional information on giving a gift of closely held stock. If you include JBS in your plans, please use our legal name and federal tax ID.